Vitamin A deficiency (VAD) has been recognised as a significant public health problem continuously for more than 30 years, despite current interventions. The problem is particularly severe in populations where rice is the staple food and diversity of diet is limited, as white rice contains no micronutrients. Golden Rice is a public-sector product designed as an additional intervention for VAD. There will be no charge for the nutritional trait, which has been donated by its inventors for use in public-sector rice varieties to assist the resource poor, and no limitations on what small farmers can do with the crop—saving and replanting seed, selling seed and selling grain are all possible. Because Golden Rice had to be created by introducing two new genes—one from maize and the other from a very commonly ingested soil bacterium—it has taken a long time to get from the laboratory to the field. Now it has been formally registered as safe as food, feed, or in processed form by four industrialised counties, and applications are pending in developing countries. The data are summarised here, and criticisms addressed, for a public health professional audience: is it needed, will it work, is it safe and is it economic? Adoption of Golden Rice, the next step after in-country registration, requires strategic and tactical cooperation across professions, non-governmental organisations (NGOs) and government departments often not used to working together. Public health professionals need to play a prominent role. 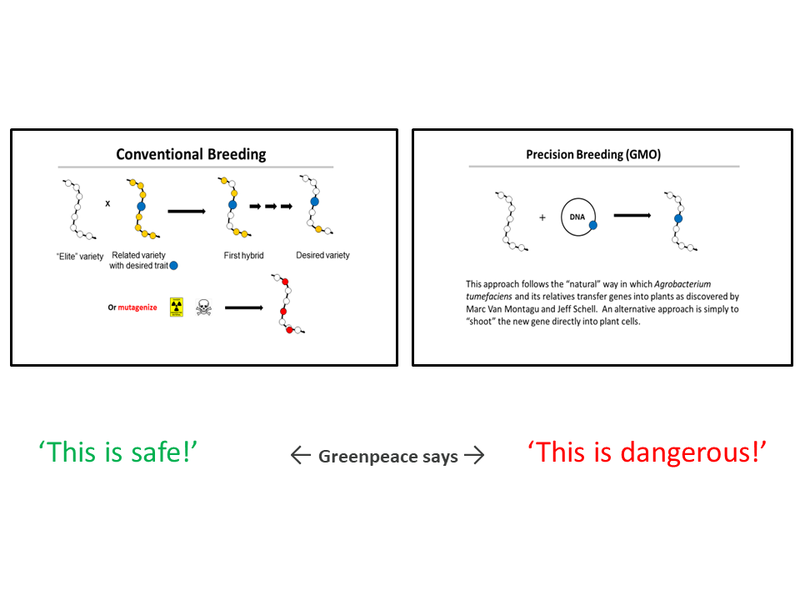 Sir Rich Roberts, FRS, organized an open letter from fellow Nobel Laureates to Greenpeace, the UN and the Governments of the World, decrying their unscientific treatment of GMO-crops. Two years later, in June 2018, Dr Roberts talked about his views at the 68th Lindau Nobel Laureate Meeting with Young Scientists, Germany. Sir Rich: “At the meeting I described the Nobel Laureates campaign in favor of GMOs. Examples of the benefits of the new GM technology for citizens of the developing world include Golden Rice and halting both Banana Wilt and the Fall Army Worm. For biofortification alone GMO technology can deliver high folate rice (mothers’ dietary deficiency causes birth defects), high zinc and high iron rice (dietary deficiency impedes mental development). Similarly, GMO Golden Rice provides a source of vitamin A. Vitamin A deficiency is an immune deficiency syndrome, so children die of common infections. It is also the main cause of irreversible childhood blindness. Golden Rice has been accepted as safe for consumption by the Governments of Australia, Canada, New Zealand and USA, and registrations have been applied for in Philippines and Bangladesh. Yet, significantly due to rejection of science by activists, Golden Rice is not yet available to farmers and their communities as an additional intervention for vitamin A deficiency. And neither high folate rice, nor high iron rice, nor high zinc rice, nor Golden Rice could be developed without the use of GMO-technology. 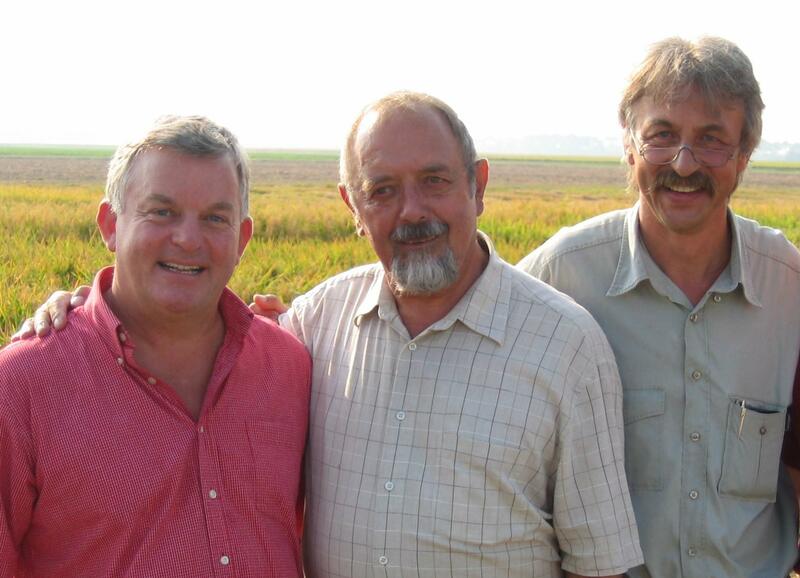 In early 2001, the International Rice Research Institute (IRRI) in the Philippines became the first licensee of Professors Ingo Potrykus and Peter Beyer for what became known as Golden Rice. IRRI agreed to develop Golden Rice to fulfil the inventors' vision: to make the nutritional benefits of Golden Rice available as an additional intervention for vitamin A deficiency (VAD), without any additional cost compared to white rice, in developing countries to governments, small farmers or consumers. Except for commercial export, no restrictions were imposed on what the farmers could do with the seed. 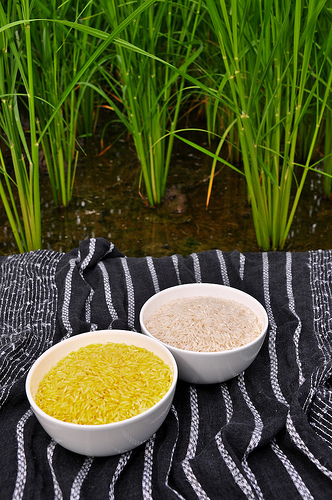 Golden Rice was designed by its inventors, and the technology donated by them, to help the ‘resource poor’. 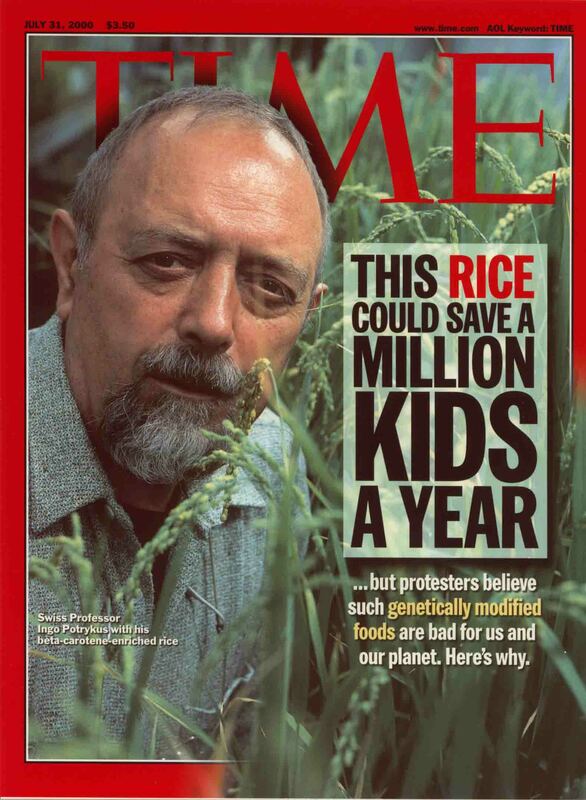 In the same year, I was fortunate to accompany Ingo and Peter to deliver to IRRI the first 600 seeds, and six 2.5mL tubes of the genes necessary to turn any white rice into a biosynthetic factory for beta-carotene. Beta-carotene, from any source, is converted by the human body into vitamin A. It is vitamin A which is essential for a functional immune system, allowing children and their mothers to fight infection and to prevent the childhood blindness often associated with VAD. Later research confirmed that the beta-carotene in Golden Rice is converted very efficiently into vitamin A. As a source of vitamin A Golden Rice can be as effective as milk, eggs or butter. 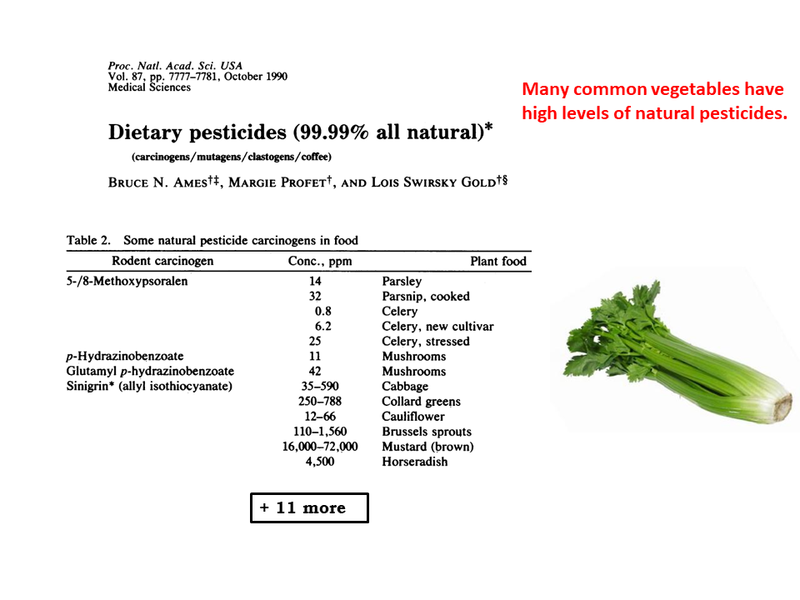 Only 40 grams consumed daily is expected to prevent death and blindness, with no possibility of overdosing, as the human body only converts the beta-carotene it needs to vitamin A and excretes the rest unchanged. Shortly after Ingo and Peter had published their initial ‘Proof of Concept’ research in 2000, they elicited the help of Syngenta. In return for Syngenta committing to assist the inventor’s humanitarian project, Syngenta acquired the commercial rights to the inventor’s core technology. In 2004 Syngenta renounced its commercial interest in favour of more profitable opportunities. But not before its scientists had made significant improvements to the technology. As they were obligated to, Syngenta passed the technology rights and the improvements, as seed, to the inventor’s licensees, including IRRI, in 2006, so that IRRI could continue to fulfil their licence obligations to the inventors. Meanwhile, extensive data sets have been generated the data files alone total 32 megabytes proving that Golden Rice differs from white rice only by the presence of beta-carotene, is safe to consume, and cannot cause allergies. It is direct descendants of one of those seeds, known as GR2E, delivered to IRRI in 2006, multiplied and introduced into Asian varieties of rice by conventional breeding, which have provided that data. Although it is hard to imagine that such golden grains of polished rice could be included in commercial shipments of white rice by accident, in the modern world any such inclusion could be damaging to international trade. To prevent even such an unlikely situation, the regulatory data has been made available not only to countries where VAD remains a very significant public health problem, but also to other countries which import rice. Independent regulators have confirmed Golden Rice’s safety. The inventors vision, expressed in Time magazine’s headline in July 2000, is getting closer. Despite the protesters' beliefs. The 2016 World Food Prize has been awarded to the group of scientists who have tirelessly worked on breeding and introducing orange-fleshed sweet potatoes to Africa and thus benefitting millions of people, especially children, who are most susceptible to a lack of provitamin A. The World Food Prize thus once again recognises efforts to increase the quality and quantity of available food to the most vulnerable populations in the world. Three of the 2016 laureates - Drs Maria Andrade, Robert Mwanga and Jan Low are from the CGIAR International Potato Center (CIP). 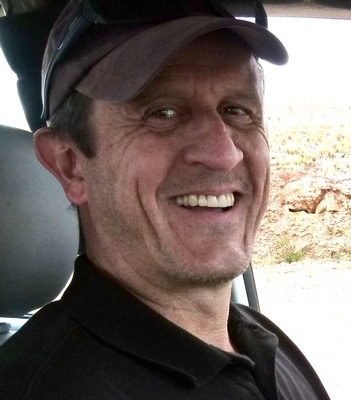 The fourth winner, Dr Howard Bouis, is the founder of HarvestPlus at the CGIAR International Food Policy Research Institute (IFPRI), and is being recognised for his work over 25 years to ensure biofortification was developed into an international plant breeding strategy across more than 40 countries. Vitamin A deficiency (VAD) is considered to be one of the most harmful forms of malnutrition in the developing world. It can cause blindness, limit growth, and weaken the body's immune system, thereby increasing morbidity and mortality. The condition affects more than 140 million pre-school children in 118 nations, and more than seven million pregnant women. It is probably the leading cause of child blindness in developing countries. Biofortification seeks to improve nutritional quality of food crops through agronomic practices, conventional plant breeding, or modern biotechnology, as in the case of Golden Rice. The approach of providing farmers with biofortified crops, indepedently of the technology used to achieve it, is thus the most efficient way of creating a self-sustaining and virtuous cycle of nutritional independence and life quality improvement. In the case of sweet potatoes, breeders utilise the fact that varieties producing and storing high levels of beta-carotene (=provitamin A) are available in the Andean region of South America and thus can use these for breeding purposes and create new orange-fleshed varieties acceptable to regional taste preferences in Africa. Unfortunately, such genetic variability is not available for every crop, thus requiring the use of laternative approaches to generate the new, desirable trait. Before the introduction of orange-fleshed varieties people in Africa had a preference for white-fleshed varieties, something which is changing thanks to the work of the WFP 2016 laureates and their colleagues at various international organizations. That goes once more to prove that preferences can evolve, especially when consumers can be convinced of the benefits to their children. And more than that, the example of the orange-fleshed sweet potato has proven that the matrix of biofortified crops are perfectly suited as a conduit to carry the much needed micronutrient, in this case is provitamin A. The outcome of this project calls for rapid introduction and adoption of a number of biofortified crops, like Golden Rice, biofortified bananas, cassava, sorghum, and other crops rich in other micronutrients like iron and zinc, which would address other major, widely spread nutritional deficiencies. By all standards, Nobel Prize laureates are usually considered the finest intellects that humanity has to offer, notwithstanding the fact that tens of thousands of other fine scientific minds and many other serious thinkers are supportive of biotechnology in agriculture. Add to that the simple fact that we all have been eating the biotechnology-derived products for the last twenty years without a single case of adverse effects linked to the biotechnological intervention as such, and non-experts should be able to arrive at the same conclusions that these fine minds have arrived at. And that is that biotechnology has already become part of the standard toolset used in plant breeding in combination with all other technologies developed and used since the inception of agriculture as we know it. You may also want to read Adrian Dubock's (Executive Secretary, Golden Rice Humanitarian Board) comments on how Greenpeace and other GMO critics misrepresent the Golden Rice Humanitarian Project at the Genetic Literacy Project site: "Disembedding grain: Golden Rice, The Green Revolution, and heirloom seeds in the Philippines"
Are you aware of the very important Support Precision Agriculture Initiative? If you're interested in reading about the pro GMO campaign and learn more about agricultural biotechnology follow the link provided with the initiative's name, and if you like and agree with the content please Please sign on at the following page: Join Us! and do share with your colleagues"
The White House Office of Science and Technology Policy and the U.S. Patent and Trademark Office (USPTO) have announced the winners of the 2015 recipients of the Patents for Humanity Award, among them the Golden Rice Project. Patents for Humanity is a USPTO program that recognizes patent owners and licensees working to improve global health and living standards for underserved populations. The program advances the President's global development agenda by recognizing private sector leaders who bring life-saving technologies to those in need, while showing how patents are an integral part of tackling the world's challenges. The award has been bestowed upon the Golden Rice Project, in particular to Prof Ingo Potrykus, Prof Peter Beyer, and Dr Adrian Dubock. The latter attended the official award ceremony on 20 April 2015, accompanied by Dr Rob Russell, a member of the Golden Rice Humanitarian Board. Back in 2001, in a ground-breaking humanitarian licensing arrangement, the three applicants (with Dubock then working for Syngenta) arranged in a cashless transaction for the defined commercial rights in US patent US 7,838,749 (and related patents) to be transferred to Syngenta. The inventors retained rights to the carefully and generously defined humanitarian applications. Syngenta, in return for its commercial options acquired, became obligated to support the humanitarian and non-profit vision of the inventors, and the inventors’ public sector licensees, rights to exploit any improvement, including as exemplified by patent application US20120042417 A1. Syngenta stated in 2004 that it had no continuing interest in commercial exploitation of the technology. Nevertheless, Syngenta’s obligations to support the inventors and their Golden Rice humanitarian project remain in place. 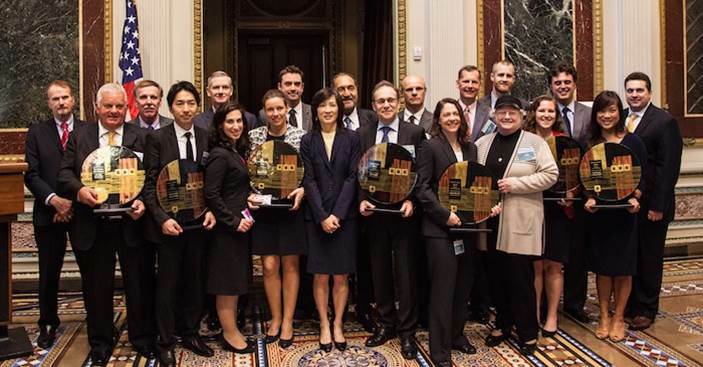 Dr Adrian Dubock (front left) collected the award at the White House on 20 April 2015 together with Prof Rob Russell, Golden Rice Humanitarian Board member(rear left). These arrangements demonstrate that patents have a very useful role, even for projects involving developing countries, where the protection of intellectual property rights may be less well developed. Without the inventors having applied for patents, it would not have been possible to discuss and develop the above mutually beneficial arrangements between the private and public sectors. Moreover, having the Golden Rice patent in place was crucial to obtaining access to the supporting technology package from other inventors. This initiative, led by Dr Patrick Moore, co-founder and 15 years leader of Greenpeace and longtime adviser to government and industries on sustainability and the environment, conducts protests and forums with the aim to end the active blocking of Golden Rice by environmental organizations who claim that it is either of no value or that it is a detriment to human health and the environment. The ALLOW GOLDEN RICE NOW! Society plans to achieve this through direct public action, media communications and coalition-building. Visit the ALLOW GOLDEN RICE NOW! Society website to find out more about dates, locations and activities. BBC Interview with Prof Hans-Jörg Jacobsen and Vandana Shiva, 20 April 2015. Your browser does not support the audio element. On November 7, 2013, Pope Francis gave his personal blessing to Golden Rice (GR). Why is this significant? Vitamin A deficiency (VAD) is responsible for 500,000 cases of irreversible blindness and up to 2 million deaths each year. Particularly susceptible are pregnant women and children. Across the globe, an estimated 19 million pregnant women and 190 million children suffer from the condition. The good news, however, is that dietary supplementation of vitamin A can eliminate VAD. One way that holds particular promise is the administration via GR, which had been engineered to produce large amounts of vitamin A. A 2012 study by Tang et al. (http://bit.ly/1bc6FJx) published in the American Journal of Clinical Nutrition found that 100-150 g of cooked GR provided 60% of the Chinese Recommended Intake of vitamin A. Estimates suggest that supplementing GR for 20% of the diet of children and 10% for pregnant women and mothers will be enough to combat the effects of VAD. Unfortunately, public misconceptions about genetically modified (GM) organisms have prevented GR from being available to the countries most affected by VAD. One such country is the Philippines, where more than 80% of the population identifies as Roman Catholic and field trials of GR are nearing completion. 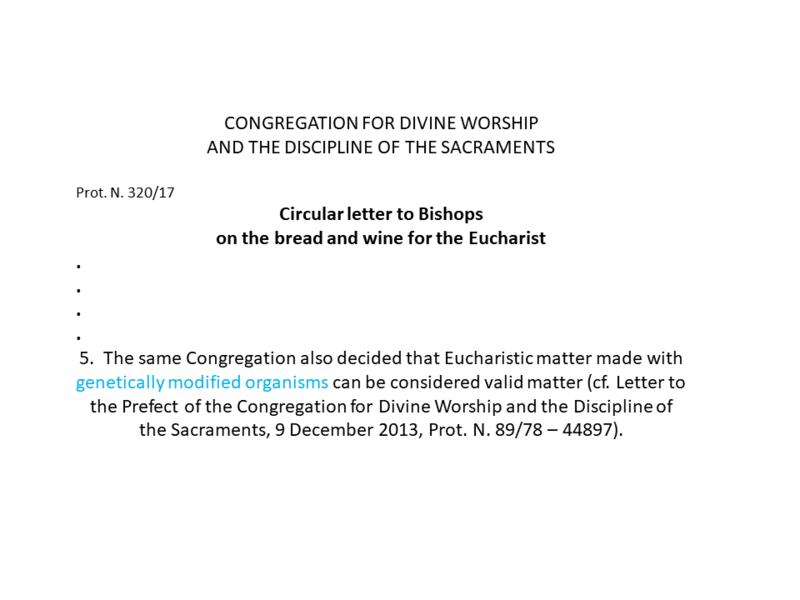 An official blessing of the church, therefore, could do a great deal to build support, allowing the Philippines to serve as a model for many of its neighbors on the potential health impacts of widespread availability and consumption of the golden grain. Regrettably, the church did not provide an official endorsement. It turns out that there is quite a distinction between the pope's personal blessing and an official statement of support from the Vatican. To understand the nature of that distinction, we turned to the person who elicited the blessing, GR coinventor and ASPB member Ingo Potrykus. At the time of the blessing, Ingo, a member of the Pontifical Academy of Sciences, had been attending a meeting at the Vatican on the interaction of nutrition and brain development. 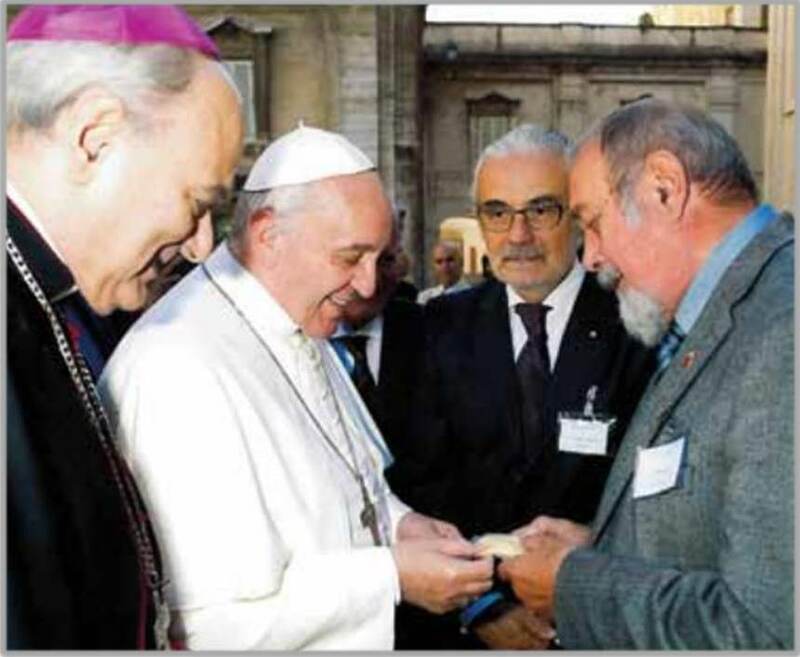 At the end of the meeting, he was able to meet Pope Francis and took the opportunity to share a packet of GR. In response, the pope offered his personal blessing. (If an official blessing of the Holy See was given, it would come from the Pontifical Council for Justice and Peace.) From Ingo's perspective, the pope is concerned that genetic modification technology primarily benefits big business and not the poor. The most immediate hurdle to the usage of GR, according to Ingo, is the impending deregulation by the Philippine Department of Agriculture. Although no damage has been reported from the recent typhoon (Haiyan) that struck this part of the world, the fields had already been harvested. Philippine officials have been following GR development and field trials for several years, and Ingo believes that the government will ultimately give "the green light." He expects that deregulation will occur in two phases: first consumption, then planting. The consumption phase will require a two-year study of the impacts of GR consumption on VAD in Philippine children. The study will be conducted by the Helen Keller Foundation for Research and Education (http://bit. ly/1bXh9AX), which has expertise in VAD and blindness. Only after the study will farmers be allowed to plant GR, said Ingo. GR distribution will be carried out by existing small-scale operations. Further, it will be sold at the same price as conventional cultivars. It is believed that this will help to facilitate adoption. In addition to vitamin A production, Ingo believes that other agronomic improvements, such as increased pest resistance and yield, will further increase the attractiveness of GR to farmers. While not a full-throated endorsement of GR or GM, the pope's blessing is a step in the right direction. It is also an important indicator of slowly shifting global attitudes regarding the role that GM foods will play in the world's long-term food security. A good start is a food start! The second best approach, especially for those who cannot afford a balanced diet, is by way of nutrient-dense staple crops. Sweet potatoes, for example, are available as varieties that are either rich or poor in provitamin A. Those producing and accumulating provitamin A (orange-fleshed sweetpotatoes) are called biofortified,* as opposed to the white-fleshed sweet potatoes, which do not accumulate provitamin A. In this case, what needs to be done is to introduce the biofortified varieties to people used to the white-fleshed varieties, as is happening at present in southern Africa by introducing South American varieties of orange-fleshed sweetpotatoes. Unfortunately, there are no natural provitamin A-containing rice varieties. In rice-based societies, the absence of β-carotene in rice grains manifests itself in a marked incidence of blindness and susceptibility to disease, leading to an increased incidence of premature death of small children, the weakest link in the chain. Rice plants produce β-carotene (provitamin A) in green tissues but not in the endosperm (the edible part of the seed). The outer coat of the dehusked grains—the so-called aleurone layer—contains a number of valuable nutrients, e.g. vitamin B and nutritious fats, but no provitamin A. These nutrients are lost with the bran fraction in the process of milling and polishing. While it would be desirable to keep those nutrients with the grain, the fatty components are affected by oxidative processes that make the grain turn rancid when exposed to air. Thus, unprocessed rice—also known as brown rice—is not apt for long-term storage. Even though all required genes to produce provitamin A are present in the grain, some of them are turned off during development. This is where the ingenuity of the Golden Rice inventors, Profs Ingo Potrykus (formerly ETH Zurich) and Peter Beyer (University of Freiburg) comes into play. They figured out how to turn on this complex pathway again with a minor intervention. The shocking fact is that, far from reaching the envisaged Millenium Development Goals, more than 10 million children under the age of five are still dying every year. A high proportion of those children die victims of common diseases that could be prevented through a better nutrition. This number has been equated with a ‘Nutritional Holocaust’ . It is unfortunate that the world is not embracing more readily a number of approaches wih the potential to substantially reduce the number of deaths. It has been calculated that the life of 25 percent of those children could be spared by providing them with diets that included crops biofortified with provitamin A (beta-carotene) and zinc. Golden Rice is such a biofortified crop. Those involved in the project are hopeful that in a near future Golden Rice will be growing in farmers' fields and helping to improve the diets of millions of people. 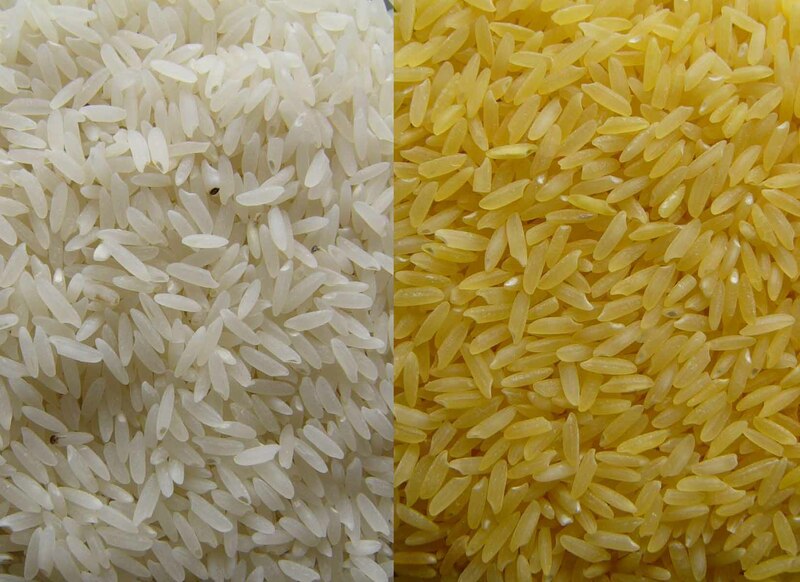 Golden Rice grains are easily recognisable by their yellow to orange colour. The stronger the colour the more β-carotene. While a yellow rice is still unfamiliar to most of us, it is hoped that the pleasant colour will help promote its adoption. Would you believe that once upon a time carrots were white or purple? Orange-coloured carrots are the product of a mutation selected by a Dutch horticulturist a few hundred years ago, because it was the colour of the Dutch Royal House of Orange-Nassau! *Welch RM and Graham RD (2004) Breeding for micronutrients in staple food crops from a human nutrition perspective. J Exp Bot 55:353-364. Rice produces β-carotene in the leaves but not in the grain, where the biosynthetic pathway is turned off during plant development. In Golden Rice two genes have been inserted into the rice genome by genetic engineering, to restart the carotenoid biosynthetic pathway leading to the production and accumulation of β-carotene in the grains. Both genes are naturally involved in carotene biosynthesis. The difference here is that the reconstructed pathway is not subject to downregulation, as usually happens in the grain. Since a prototype of Golden Rice was developed in the year 2000, new lines with higher β-carotene content have been generated. The intensity of the golden colour is a visual indicator of the concentration of β-carotene in the endosperm.Our goal is to make sure that people living in rice-based societies get a full complement of provitamin A from their traditional diets. This would apply to countries such as India, Vietnam, Bangladesh. the Philippines, and Indonesia. Golden Rice could still be a valuable complement to children's diets in many countries by contributing to the reduction of clinical and sub-clinical vitamin A deficiency-related diseases. Many people are aware that vitamin A has something to do with vision, especially at night. But many are not aware of the central role it plays in maintaining the integrity of the immune system. According to the World Health Organization, dietary vitamin A deficiency (VAD) compromises the immune systems of approximately 40 percent of children under the age of five in the developing world, greatly increasing the risk of severe illnesses from common childhood infections, thus causing hundreds of thousands of unnecessary deaths among them. In remote rural areas Golden Rice could constitute a major contribution towards sustainable vitamin A delivery. To achieve this goal a strong, concerted, and interdisciplinary effort is needed. This effort must include scientists, breeders, farmers, regulators, policy-makers, and extensionists. The latter will play a central role in educating farmers and consumers as to their available options. While the most desirable option woud be a varied and adequate diet, this goal is not always achievable, at least not in the short term. The reasons are manifold, ranging from tradition to geographical and economical limitations. Golden Rice is a step in the right direction in that it does not create new dependencies or displace traditional foodstuff. Golden Rice is the brainchild of Profs Ingo Potrykus (ETH Zurich) and Peter Beyer (Univ of Freiburg), who in a collaborative effort were able to show that production of β-carotene could be turned on in rice grains using a minimum set of transgenes. From the beginning Golden Rice was conceived as a public-good project under the guidance of the Golden Rice Humanitarian Board. The initial prototype (Science 2000) was further improved in terms of provitamin A (β-carotene) content by a research team at Syngenta (Nature Biotechnology 2005). From 2005 to 2010 the project dealt mainly with breeding the novel trait into locally adapted rice varieties. Along its way the project has been funded by a number of donors, including the Rockefeller Foundation, the Bill & Melinda Gates Foundation (Grand Challenges in Global Health Initiative), USAID, the Philippine Department of Agriculture, HarvestPlus, the European Commission, Swiss Federal Funding, and the Syngenta Foundation. 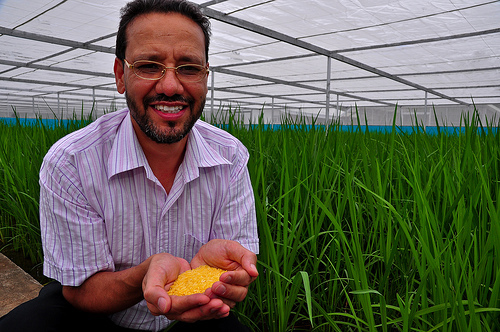 Several companies have provided free access to their patented technologies necessary to generate Golden Rice . Current breeding and field trialling work is being carried out by the International Rice Research Institute (IRRI) in the Philippines together with PhilRice, the Philippine Rice Research Institute. PhilRice is preparing a submission to the regulatory authority of the Philippines in 2013, which could lead to initial releases to farmers in 2014. And the work doesn't stop there. If the first hurdles are taken successfully, then Golden Rice will be heading towards China, India, Bangladesh, Indonesia, and Vietnam. In those countries national programs are already involved in laying out the necessary groundwork. Helen Keller International (HKI) has been working to address vitamin A deficiency (VAD) for well over 30 years and continues to work with local partners to deliver vitamin A to those in need through implementation of complementary interventions including vitamin A supplementation, promotion of optimal breastfeeding, dietary diversification and food fortification. HKI considers that Golden Rice may have the potential to be another complementary vehicle to combat vitamin A deficiency, particularly among those who are not reached by other mechanisms. Hence, HKI is working on determining the efficacy of Golden Rice to improve the vitamin A status in deficient individuals. If proved efficacious and once approved by the regulatory bodies, HKI would proceed to include Golden Rice in their VAD combatting toolbox. 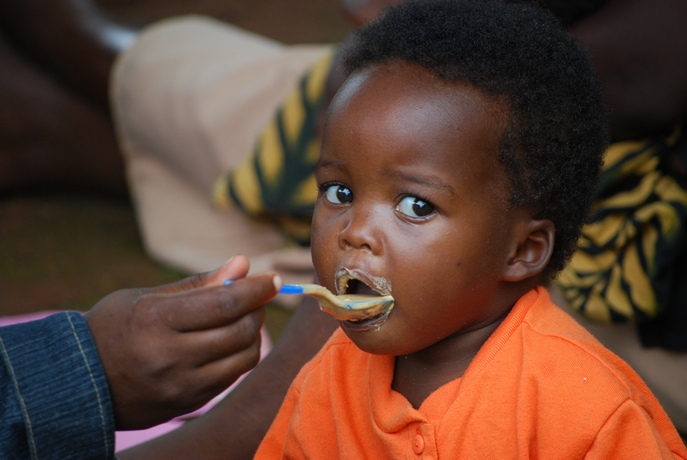 According to HKI 190 million pre-school children and 19 million pregnant women are currently vitamin A deficient. Each year, an estimated 670,000 children will die from VAD, and 350,000 will go blind. In the Philippines, approximately 1.7 million children aged 6 months to 5 years and an additional three out of every ten school-aged children have VAD, as do one out of every five pregnant and lactating mothers. In Bangladesh, one in every five of pre-school aged children are estimated to have VAD. In these, as almost in all developing countries, effective distribution systems for vitamin A supplementation are not in place to reach all people in need adequately and consistently. Supplementation programs incur high logistic costs that not every region can afford. Those most in need of this new seed-based technology are those who can least afford buying an adequate diet, rich in essential nutrients. This has been taken into consideration by the creators of Golden Rice, Profs Peter Beyer and Ingo Portrykus, and the crop protection company Syngenta, who have worked together to make the latest, improved version of Golden Rice available for humanitarian use in developing countries, free of charge. The Golden Rice Humanitarian Board encourages further research to determine how the technology may play a part in the ongoing global effort to fight Vitamin A Deficiency in poor countries. While Golden Rice is an exciting development, it is important to keep in mind that malnutrition is to a great extent rooted in political, economic and cultural issues that will not be solved by a technical fix. Yet Golden Rice offers people in developing countries a valuable and affordable choice in the fight against the scourge of malnutrition. This site is maintained by the Golden Rice Humanitarian Board for the purpose of providing information on the background and progress of the Golden Rice Humanitarian Project. Eat orange! We really mean it! Tuberculosis is a neglected disease, according to a newly published report in the Lancet, a medical journal. The experts’ plan is to end it within a generation. That is ambitious, even by the lofty measure of such proclamations. In 2017 tuberculosis killed 1.6m people, more than any other infectious disease. A quarter of the world’s population have latent TB infections, almost all in developing countries. Of them, 5-15% will develop the disease, mostly those whose immune systems are weakened by HIV, malnourishment or smoking. The plan calls for new drugs, vaccines and diagnostic tests, as well as doubling annual spending. Treating those who fall ill is crucial to preventing its spread. Yet currently more than a third of them go untreated. And nearly half a million new cases are resistant to several tuberculosis drugs. There seems a good chance the next generation will still be living with TB’s scourge. August 2012. Researchers from USDA (Boston and Houston), Chinese instituions in Hunan, Beijing, and Hangzhou, and NIH (Bethesda), have determined that the β-carotene in Golden Rice is as effective as pure β-carotene in oil and better than that in spinach at providing vitamin A to children. A bowl of ∼100 to 150 g cooked Golden Rice (50 g dry weight) can provide ∼60% of the Chinese Recommended Nutrient Intake of vitamin A for 6-8-year-old children. The paper, with data based on a registered clinal trial, has been published by the American Journal of Clinical Nutrition. And there is good reason to conduct these studies in China, considering the low vitamin A status of a great proportion of Chinese children (see Nutrition and Health Status Report). Back in 2009, researchers were able to demonstrate that Golden Rice was an effective source of vitamin A. This investigation was done with a group of healthy adult volunteers in the USA. The study showed that the β-carotene contained in Golden Rice was highly available and easily taken up into the bloodstream by the human digestive system. While foodstuffs of plant origin are the major contributors of β-carotene in the diet, these are often absent from the diet, for customary and economic reasons. And moreover, conversion of the provitamin A carotenoids contained in them is generally inefficient. Conversion factors for provitamin A carotenoids from various fruits is in the range of 13:1 for sweet potato, 15:1 for carrots, and between 10:1 and 28:1 for green leafy vegetables. With a conversion factor of 4:1 Golden Rice displays a comparatively very favourable conversion ratio. This study was published in the American Journal of Clinical Nutrition in 2009.